Rugby Town’s Butlin Road will host a double header of football this weekend, with Valley up against Bromsgrove Sporting in the Preliminary Round of the FA Cup on Saturday before the first event of the club’s diamond jubilee celebration sees a legends match against a Leicester City side on Sunday. After their league season started with the disappointing return of just one point from their opening two fixtures, Town will be looking to bounce back against Midland Football League (Division One) opposition in the Preliminary Round of the nation’s favourite football knock-out competition. Rugby twice let slip leads over the past week in their NPL South Division games, allowing Gresley to equal up a two goal deficit last Saturday and then having another second half advantage overturned by Stamford in a 2-1 defeat on Tuesday evening. 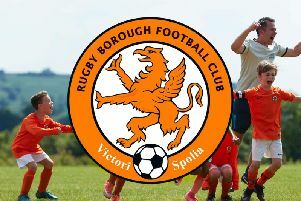 Both opponents struck hammer blows in the third minute of stoppage time to give new Valley manager James Jepson a harsh introduction to life on the touchline. Jepson did complete the signing of winger Andy Hall in time for the ex-Coventry City and Kettering man to make a second half substitute appearance against another of his old clubs Stamford on Tuesday, and with the long term loss of another wide player Conor Green with suspected cruciate damage at Gresley, Hall’s arrival and progression towards full match fitness will be much welcomed – especially with another winger Louis Hamilton also struggling with injury. Rugby’s one point return leaves them down in 16th in the early divisional table, although there were enough positive signs in the two performances to reassure supporters that the team is ahead of the game compared to last season’s stuttering start which saw them spend the initial part of the campaign earmarked as potential relegation candidates. Looking ahead to the FA Cup tie, Bromsgrove earned the right to face Town after their three goal victory at Heath Hayes a fortnight ago in the Extra Preliminary Round, and with the draw for the next (First Qualifying) round already made, the two sides will be looking to tee up a home tie against Southern League Premier Corby on September 3rd. Another three goal margin – this time at home to Southam – gave Sporting a winning start to their league term at a level two below that of Town’s. If a cup replay is required, it will be played at Bromsgrove’s Victoria Ground on Tuesday (23rd) evening, with Town then returning to league action against two teams that also opened their own league campaigns without a win between them – namely Kidsgrove (away) next Saturday and Carlton (home) on Bank Holiday Monday. Meanwhile a Rugby side managed by previous manager Billy Jeffrey will take on a legends team of the current Premier League champions for a 2pm kick-off on Sunday. The named visiting legends squad includes four players – Steve Walsh, Muzzy Izzet, Steve Guppy and Julian Joachim – with just short of 900 Foxes first team appearances between them as well as Matt Piper – sold by City for £3.5 million to Sunderland in 2002. It also draws upon celebrities from the world of entertainment and other sports, with Kasabian guitarists Sergio Pizzorno and Chris Edwards set to take part in the charity game, and England’s Rugby Union World Cup winning captain Martin Johnson and WBA International Boxing Champion Rendall Monroe also scheduled to play. Valley’s probable squad includes one-time favourites Robbie Beard, Craig Herbert, Danny Hall, Chris Freestone, Mark Rosegreen, Mick Shearer and Terry Angus, with its previous manager Dale Belford set to make a quick return to Butlin Road between the sticks and the popular midfielder David Staff – who won the 2009 Sky One series of the Gladiators – also named. Admission to the legends game is £6 for adults, £3 for concessions and £1 for children under 16. The game is the first of a series of events to commemorate the club’s first competitive match in September 1956, and they will raise money for a variety of good causes including Rugby Myton Hospice, Warwickshire and Northamptonshire Air Ambulance, Friends of St Cross Hospital in Rugby and the Birmingham Children’s Hospital. # If an FA Cup replay is required next Tuesday, the coach to Bromsgrove will leave Butlin Road at 5.30 p.m. For latest information, contact Tony Mann on 07970 691366.